Abstract: Every store I visit carries multiple Asus products - there's really no other manufacturer with such a broad selection. Asus is easily the most common brand available our local computer shops big and small. Every store I visit carries multiple Asus products - there's really no other manufacturer with such a broad selection. That kind mass market approach has gone along way towards also making Asus one of the most respected component manufacturers out there. Asus hold the distinct position of being highly respected not only for their status as a Tier one manufacturer, but also by their competition, which usually gives them the advantage of being first to market when new technology is launched. 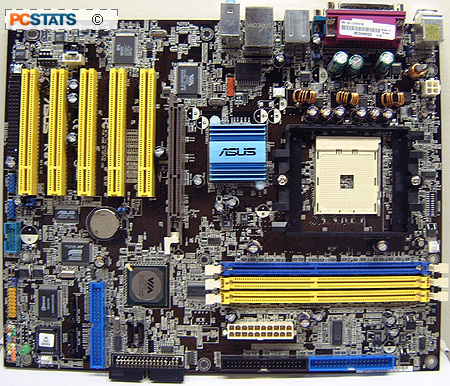 Asus was first to come out with an AMD 760MPX based motherboard when that was released, as well as the more recent nForce2 and i875P-based motherboards. In our neck of the woods, the Asus K8V is one of the few Athlon64 motherboards that can be found readily. 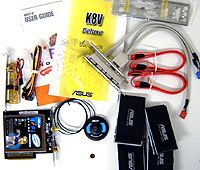 The fully-equipped Asus K8V-DLX/WiFiB is based on VIA's popular K8T800 chipset, meaning it supports the Socket 754 AMD Athlon64 processor. The three DIMM slots can absorb up to 3GB of unbuffered ECC or non-ECC DDR memory paced as fast as PC3200 speeds. Standard features of the board include an additional Serial ATA/Serial ATA RAID controller, a third IDE channel, 5.1 audio, 3Com Gigabit LAN, IEEE 1394a and a proprietary 802.11b wireless LAN adapter that we'll get to in a moment. Thrown in for good measure is interVideo's WinDVD software suite, and a bundle of headers and other cables that are sure to come in very handy.